My check engine light came on last week during my morning commute to work. I spent the rest of the drive imagining all kinds of things that could be wrong and how much each one would cost to fix. A co-worker suggested I go to an O’reilly or AutoZone and ask them to put on their code reader and check the error code for me. The problem came back as a bad O2 sensor, the guy at Autozone pointed out I had multiple sensors on my car and finding out which one to replace would be the trick. So my next step was to take it to the dealer dealer to figure out which sensor it was and how much it would cost to fix. Taking it to the dealer might have been a mistake, they charged me a $80 diagnostic fee just to plug it into their computer. I’m not sure what more they do for diagnostics than AutoZone but $80 seems pretty steep. Anyhow, they came back and said I needed a new catalytic converter, which would run me right around $1000. I declined the repair so I could take my car to another shop and get a second opinion before dropping a thousand dollars. The dealer didn’t clear my error code but driving home from work yesterday my check engine light switched back off on it’s own. I’m assuming it’ll pop back on again since I didn’t do anything with the O2 sensors or catalytic converter so I know my problem isn’t resolved. However, I did learn that it’s probably worth while to invest in a OBD II code reader so I can check future error codes myself on my aging Accord. I don’t know much about cars but my co-worker swears by the Haynes manuals and Google for looking up and diagnosing the error codes. I’ll still need the professionals to fix the issues but at least I can check them out on my own. The biggest reason is that I want to keep an eye out for anything else that might go wrong. I know the O2 sensor and catalytic converter issues won’t do any major damage to my car but I don’t want to assume the check engine light is for those problems and then miss something major. Although it is stressful when the check engine light comes on because you know it means you’ll probably be spending some money – it is helpful to have the warning. It can also be useful to have warning indicators for your finances. The ones I use most frequently are alerts from my bank and credit card company that let me know if payments are due or late or balances are low. Rather than having to login every day and check for any outstanding issues, I rely on the alerts to tell me when I need to worry about something. 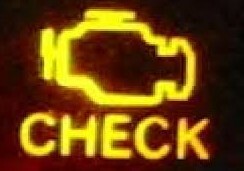 Just remember that similar to the check engine light in your car, ignoring the warning signs can end up costing you money! Here are a few recent personal finance articles from around the web you might want to check out. While you might have a bad O2 sensor or converter, it might be something simple. If the light went off on its own, and no one reset it, then it might be benign. I had a car which if you did not click the gas cap 4 times at least, I got a check engine light (since it required it to be darned tight). I had the light come on multiple times and a few trips to autozone and “bad O2 sensor” as the code readings, I realized the game. Just be careful as the reader only tells you what the car is detecting, and might not be the problem. An O2 sensor requires pressure in the gas system, and if you have a loose gas cap, there is a lack of pressure which is out of spec – thus you get a warning light. Now that you mention the loose gas cap, it seems like that’s happened to me in the past, years ago. I suppose that could be it again, I’ll keep an eye on it, thanks for the tip! I second the comment. Suggest you read the owner’s manual. On my last car, the check engine light came on. Owner’s manual said that could happen if the gas was really low and filling the tank would cause the warning light to go out. Something to do with particulates density when the tank was nearly empty. Of course, the second option listed in the owner’s manual was something really bad and said that if I kept driving it, I would invalidate the warranty.